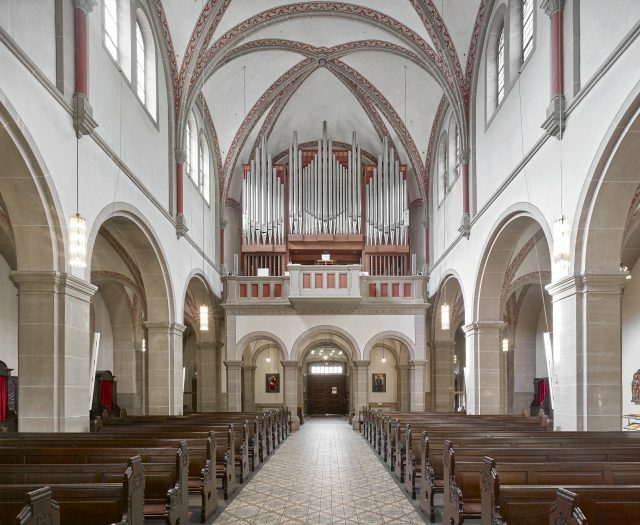 With the construction of the new organ for St. Nikolaus in Köln-Sülz originated in our workshop an opulent three manual instrument which commits itself, on the one hand, to the German romantic style of the former organ from 1917 and integrates to the other well-chosen characteristic feature of other styles without breaking its sound structure. 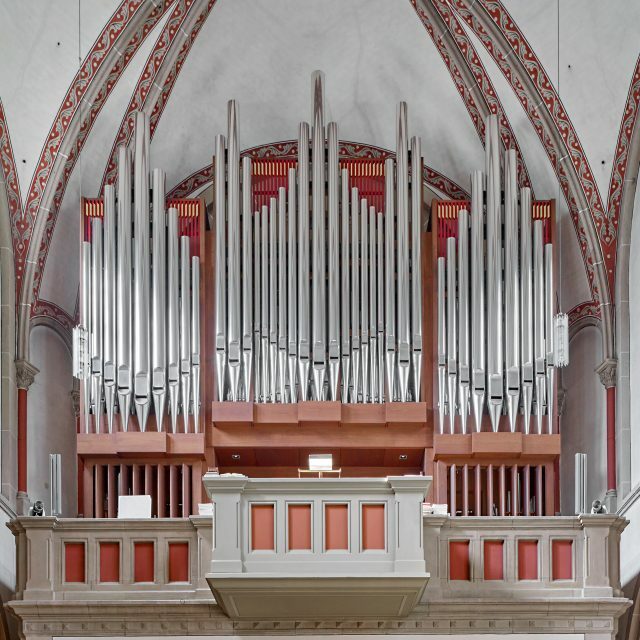 The draught of the organ facade found his starting point also in the organ of 1917 whose architectural trisection also returns in the new organ strikingly. In the centre of the arrangementon, on slender foundation, the main work is flanked from the set off fields of the pedal towers in whose untercase the swellable positive is accommodated. Behind the main work the rich ornated swell is located. As a specific feature, its shutters on the back wall can be handled seperately and create an indirect sound that seems to be a Fernwerk, that steers its sound straight in the tower space. 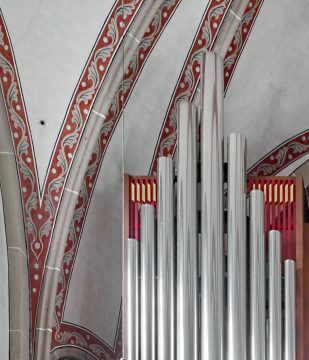 However, both stops of the solo are placed close under the church vault about the main chest and perceive from here their exposed musical duties. 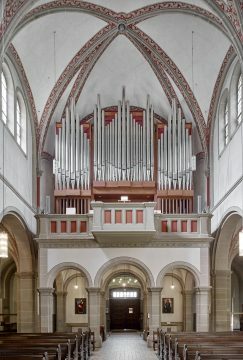 As a miraculous rounding-off of the organ sound, the bass serves the very wide scaled covered 32 ‘ stop which stands completely behind in the tower space under the rosette and develops in the church space gravely. 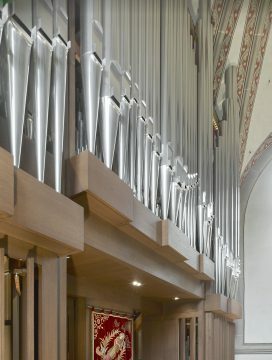 Since the ceremonious organ inauguration on the 15th of November, 2009, thanks to the initiative of the organist Marius Horstschäfer the organ is not only used during the liturgy full of quality, but diverse, already active concert activities have been developed to our joy. II/I, III/I mechanisch, Solo/I, I/I 16’, III/I 16’ elektr. III/II mechanisch, Solo/II, II/II 16’ elektr. I/P, II/P, III/P mechanisch, Solo/P, III/P 4’ elektr. Mechanische Spieltraktur im alten Spieltischgehäuse von 1917, Elektrische Registertraktur, Setzeranlage, Crescendowalze.